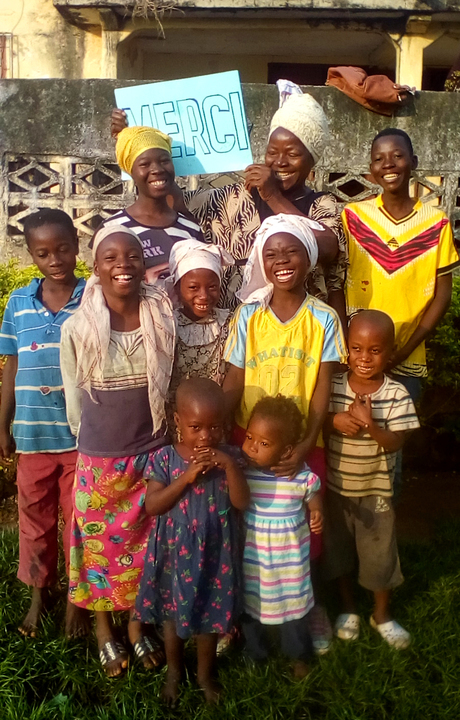 Dear friends and family, Many of you already know the story of Joan Gono, who has opened her home and her heart to vulnerable children in N’Zérékoré, Guinea, West Africa, for the last 10 years. You have learned that the children are essentially alone in the world when they arrive at her door, scared, malnourished, and often sick. And you have seen that at some point, after joining Joan’s family, they learn to smile again. This year’s update bears out this now-familiar story, which continues both because of ongoing need and because of ongoing love and commitment. Since 2008, Joan has ensured a better future for more than 50 children whose lives were forever changed by the death of one or both parents (e.g., from AIDS or childbirth) or the inability of their parents to care for them. And since 2012, we have played an important role in keeping Joan’s orphanage safe, functional, and open to children looking to come home—home, that is, to the loving arms of “Mama Joanna,” as she is affectionately known in the community. This past year has been no exception. Since we last checked in with Joan, she has added three more children to her family. After their father died, Marie’s mother brought her and her younger brother, François, to Joan because she could not provide for them. Agnes came to Joan after her mother died and her father realized he could no longer care for her. These children were sad and withdrawn at first, and in some cases malnourished and ill, but they have since come out of their shells, Joan reports, and are now healthy and happy. Thanks to the caring of donors like you, these children, with the other 13 children at the orphanage and 10 in foster care whom Joan and her small staff support, are making great strides and have a chance, not just to survive but also to thrive—a chance they otherwise would not have had. This is the seventh year that I have asked you to open your hearts to Joan Gono, just as she continues to open hers to these children. Over the years, your support has gone toward school supplies, clothing, medicines, and food—things instrumental to ensuring the children’s continued well-being. Last year, we helped pay for much-needed repairs to the orphanage building that many of Joan’s children call home. This year, Joan plans to put your generous contributions toward solar panels, which will provide lower-cost electricity, as well as toward roof repairs and other maintenance. Please join me again this year in supporting Joan’s orphanage, helping to make a better life possible for all who enter its doors. Your contribution—of any amount—will make a critical difference for children like Marie, François, and Agnes. If so inspired, please share this appeal with your friends and family and through your social networks. I thank you for your support. And Joan also extends her deepest thanks to you. We hope you enjoy the photos, provided by Joan, of the children your past generosity has helped support—faces that represent hope and a bright future ahead. With gratitude, Alisha Horowitz P.S. 100% of the money raised will go to helping the children and the orphanage they call home. Please note that this is not a U.S.-registered nonprofit, which means that you would probably not be able to deduct any contribution as a charitable deduction on your taxes, but please check with your tax advisor for specifics. Many of you already know the story of Joan Gono, who has opened her home and her heart to vulnerable children in N’Zérékoré, Guinea, West Africa, for the last 10 years. You have learned that the children are essentially alone in the world when they arrive at her door, scared, malnourished, and often sick. And you have seen that at some point, after joining Joan’s family, they learn to smile again. This year’s update bears out this now-familiar story, which continues both because of ongoing need and because of ongoing love and commitment. Since 2008, Joan has ensured a better future for more than 50 children whose lives were forever changed by the death of one or both parents (e.g., from AIDS or childbirth) or the inability of their parents to care for them. And since 2012, we have played an important role in keeping Joan’s orphanage safe, functional, and open to children looking to come home—home, that is, to the loving arms of “Mama Joanna,” as she is affectionately known in the community. This past year has been no exception. Since we last checked in with Joan, she has added three more children to her family. After their father died, Marie’s mother brought her and her younger brother, François, to Joan because she could not provide for them. Agnes came to Joan after her mother died and her father realized he could no longer care for her. These children were sad and withdrawn at first, and in some cases malnourished and ill, but they have since come out of their shells, Joan reports, and are now healthy and happy. Thanks to the caring of donors like you, these children, with the other 13 children at the orphanage and 10 in foster care whom Joan and her small staff support, are making great strides and have a chance, not just to survive but also to thrive—a chance they otherwise would not have had. This is the seventh year that I have asked you to open your hearts to Joan Gono, just as she continues to open hers to these children. Over the years, your support has gone toward school supplies, clothing, medicines, and food—things instrumental to ensuring the children’s continued well-being. Last year, we helped pay for much-needed repairs to the orphanage building that many of Joan’s children call home. This year, Joan plans to put your generous contributions toward solar panels, which will provide lower-cost electricity, as well as toward roof repairs and other maintenance. Please join me again this year in supporting Joan’s orphanage, helping to make a better life possible for all who enter its doors. Your contribution—of any amount—will make a critical difference for children like Marie, François, and Agnes. If so inspired, please share this appeal with your friends and family and through your social networks. I thank you for your support. And Joan also extends her deepest thanks to you. 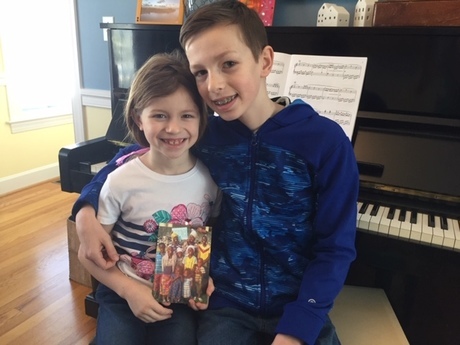 We hope you enjoy the photos, provided by Joan, of the children your past generosity has helped support—faces that represent hope and a bright future ahead. P.S. 100% of the money raised will go to helping the children and the orphanage they call home. Please note that this is not a U.S.-registered nonprofit, which means that you would probably not be able to deduct any contribution as a charitable deduction on your taxes, but please check with your tax advisor for specifics. Robert Mazur15 weeks ago Best wishes. Jennifer Poitras15 weeks ago Best wishes. Anne Upczak Garcia15 weeks ago Thanks for continuing to do this Alisha. Amy brown15 weeks ago Merry Christmas and Happy New Year!! Love you!! Steven Soloway16 weeks ago Best wishes. Kelly17 weeks ago Joyeux Noël Joan, et merci pour votre gentillesse. And thanks Alisha for all your work setting up this connection!